You should be redirected automatically in a few moments, but if not, please click here to see if Port Sunlight: traces of nature in the man-made landscape has made the transition. I visited Port Sunlight late last year. It was something I’d been meaning to do for ages, and it was a gorgeous day! The reason it was (for want of a less pun-tastic phrase) right up my street is that Port Sunlight is a classic and easy-to-read ‘landscape’, in the sense that word is used on this blog: it was created in one quick phase, for one purpose, obliterating everything that came before it. And what’s more, it’s changed little since it was created. W. H. Lever (later Lord Leverhulme) was a soap manufacturer, son of a Bolton grocer. So successful did he become in his speciality of selling soap with the family business, that he set up on his own with his brother, James Darcy Lever. Their first factory was in Warrington, but the company soon outgrew the site, and new locations were sought. They settled on a location near Bromborough on the Wirral. It’s always fascinating to look at what was on a site prior to the thing we’re studying. For the city of Liverpool, there was little other than marshland, probably a farm, and the Pool itself. There, this mixture was crucial for King John to choose the site for this new town. Similarly, the landscape near Bromborough was perfect for king Lever to establish a manufactory. The land was flat – suitable for expansion – and contained very little in the way of existing buildings. I learned from the official Port Sunlight guidebook that the mayor of Bromborough once lived in a house that was eventually demolished to make way for the expanding village (long after he’d left). There were also a handful of slum dwellings in the north west corner of the site. Was the presence of such bad housing part of the reason Lever was inspired to build his high quality dwellings for his workers? We’ll probably never know. The area was also accessible by the Bromborough Pool. Like the Liver Pool, this was an inlet up which boats could come and deliver raw materials for the factory, which was built at the head. Flowing into the Bromborough Pool were three streams, which flowed north east, came together and travelled south east before discharging into the Pool. The Ordnance Survey map of 1882 (six years older than the oldest parts of Port Sunlight) show us that there was a cement works on the future site of Lever’s factory, so the Pool had already been taken advantage of. 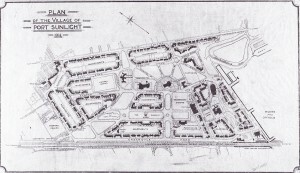 The three streams ran across the marshy site, presenting a planning challenge to Lever’s architects and planners, but a study of the evolution of the village shows how they dealt with this challenge. 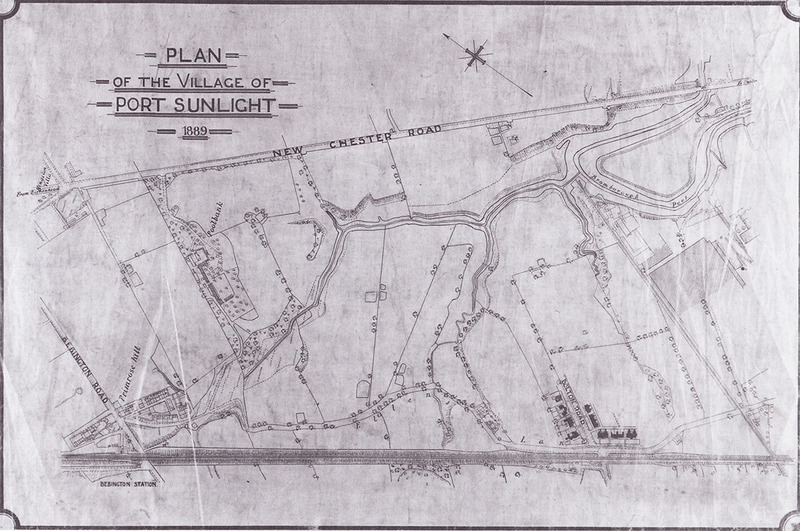 Because of the way it was planned, Port Sunlight has left us a wealth of archives recording the development of the village from the earliest days. Below is a map from 1889, just a year into the project. William Owen (who remained an important friend, colleague and architect in Lever’s life) designed the first cottages on the site, at the junction of Bolton Road and Greendale Road. Primrose Hill, in the north west corner, is still occupied here by the slum housing that was to find short shrift under Lever’s residency. You can see the creeks travelling across the future village site before diverting sharply south east towards Bromborough Pool. 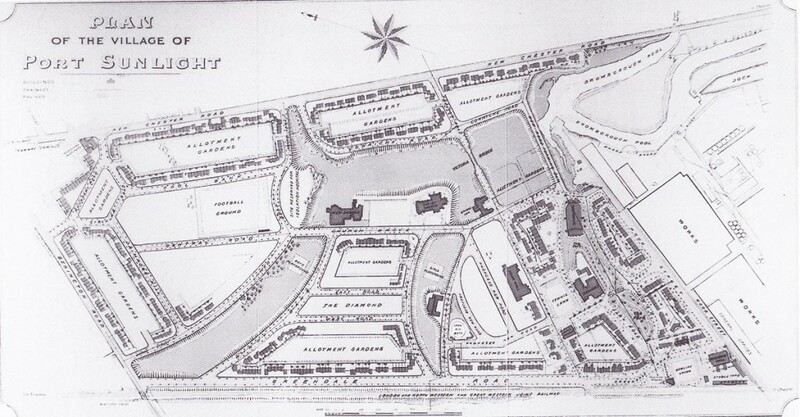 The previous map shows little of the formal planning that an examination of a modern map of the site reveals today. However, just six years later another map (from Lever’s own book, The Buildings Erected at Port Sunlight and Thornton Hough, 1905) is much more recognisable as a suite of tidy roads and cottage plots. There are also allotments marked (Lever considered allotments an important aspect of his workers’ lives), a tennis lawn, church and other public buildings to enhance life in the settlement. What’s really clear from this map, when held next to the earlier one, is how wide spaces have been avoided by the planners. The two playgrounds and ‘The Dell’ (crossed by Victoria Bridge) are free of housing and there are fewer buildings between what would become the theatre and auditorium. So despite the very ordered landscape that was being rapidly imposed on the Wirral landscape, it was strongly influenced by what came before. A photograph of 1901 shows that Victoria Bridge still stood in tidal waters, although over time this was to disappear as the area was drained. By the beginning of the First World War, Port Sunlight had taken on much of the form it would keep for the next 100 years. One or two further blocks were to be filled in, and new houses were added here and there. Some of the public buildings would alter their use, if only to keep up with the times, and some houses destroyed in air raids have been reconstructed in identical form to the originals. The plan of the village from this year shows that there is still a swathe of green land from the Bromborough Pool to the Cottage Hospital and down through the (future) Lady Lever Art Gallery. There’s another going south through the war memorial (again, a development still in Sunlight’s future). Comparing this map to a modern satellite view on Google Maps shows that much of the shape of the village is the same. These specific areas remain free of buildings up to this day. Funnily enough, the guidebook provides another map, this one from 1938 (the first of the village’s Jubilee, though drawn later by the guidebook’s authors), which outlines a rough area stretching from the Pool and around the open areas. From this map it’s clear to see the coincidence of the old creeks with the modern layout, even by the time of the village’s completion. 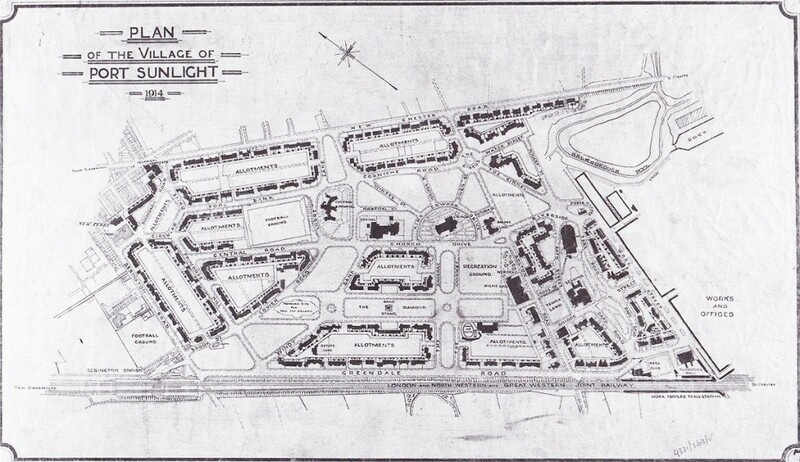 It’s hard to overstate the inspiration William Hesketh Lever’s planned community had on later developments – they are everywhere to see. Soon after Port Sunlight was begun, George Cadbury in 1893 bought 120 acres of land near Birmingham for the future Bournville model village, heavily inspired by his contemporary in Cheshire. In the following century the garden city and garden suburb movement gained speed and traction, aided not least by Lever himself who was keen to extend his ideas of decent working class living beyond his own company. 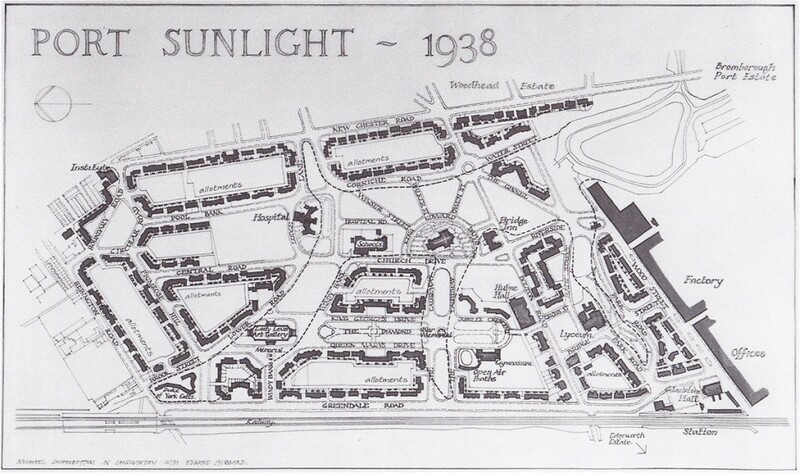 Letchworth and Welwyn can both trace their roots back to the development of Port Sunlight. None other than Edward Lutyens, architect of the aborted Catholic Cathedral, designed a couple of houses, though as the Port Sunlight guidebook points out, these were far from the heights of his later works. Charles Herbert Reilly was a professor at the Liverpool School of Architecture. He too designed a block of Port Sunlight houses, but his greatest role was in his influence and encouragement of Lever himself. Lever took on board much of what was going on across the Mersey in the university, and eventually helped found the Department of Civic Design at Liverpool in 1909. This was the country’s first town planning department, and was itself increasingly influential through the Town Planning Review, which it financed from 1910. 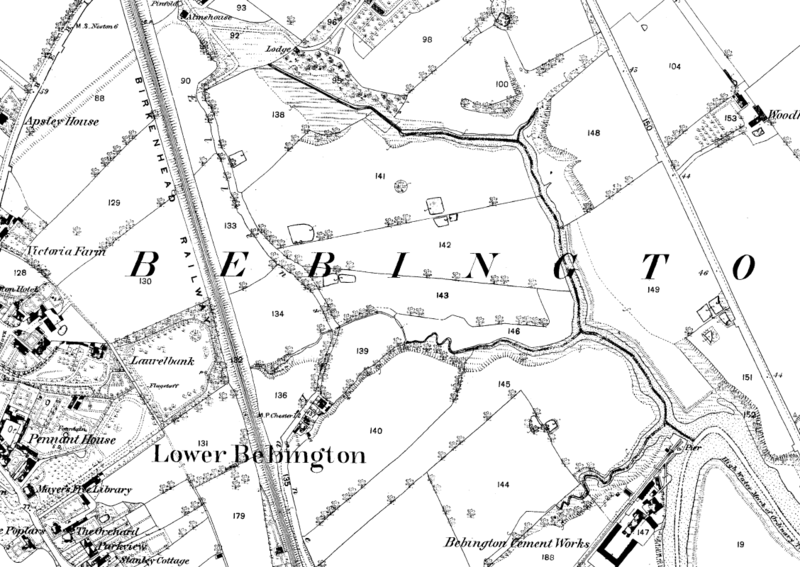 So, this area between Bebington and Bromborough was almost a blank slate when the Lever Brothers chose it to site their factory and village in 1888. However, the streams which ran across it shape the landscape to this day. In turn, Port Sunlight influenced areas spread right across the country, through links with the University of Liverpool and the Department of Civic Design. Thus the chain of influence can be traced right through the 19th century to today. And all in a smart little village on the Wirral!